Dry fruit packing pouch should be airtight and resistant to moisture as the Dry fruit is healthy food and also consumer wants to store it for a long time. We have a very experienced team who designs and develops dry fruit packing pouch which has high strength and maintains the quality of dry fruits by protecting it from moisture and air. Giriraj polymer provides cost-effective and climate resistant product and has emerged as a prominent brand as a Dry fruit packing pouch manufacturer. We have clients across the nation who trust us and are taking our services as we as a dry fruit pouch supplier have an efficient on-time delivery and prompt service. We have a large and efficient manufacturing unit which caters all order sizes from small to bulk orders. We manufacture a very attractive and appealing design with colorful print as per the requirement of client. Our pouches maintain the nutritive quality of dry fruit until it reaches the consumer end. 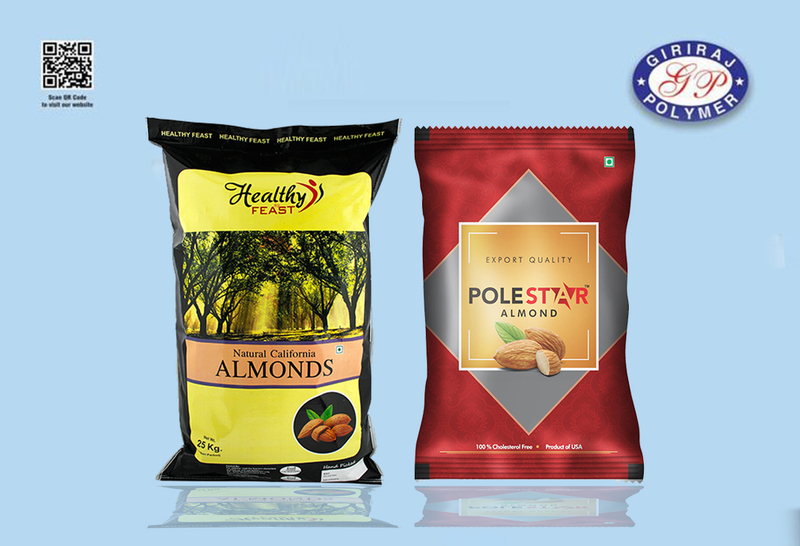 If you are launching a new brand or you want to redesign your existing brand then Giriraj Polymer is the right solution for Dry fruit packing pouch manufacturer, we will provide you with the unique, cost-efficient and appealing product as per your requirement.